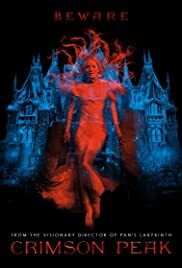 THE REVIEW: When asked whether I wanted to see Crimson Peak or not, my response was “Meh.” Despite being assured that the film is not a horror movie (it’s a gothic romance) — neither of which are what I would consider a favorite genre — I was still hesitant about whether I should go. While I had many reservations, coming out of the film I can say I was thoroughly surprised and impressed with how much I enjoyed director Guillermo del Toro’s vision and storytelling prowess. By no means is this a perfect film, but especially for Halloween season (though that time has no come and passed), Crimson Peak can make for some entertaining viewing. The best advice I can give for watching this film, and the reason I believe I enjoyed it so much, is that you can’t take it seriously. Ghosts and crazy axe murderers are present to try and scare you, along with an ominous blood-red clay that soaks through the snow in the winter giving Allerdale Hall the titular nickname of Crimson Peak. But in addition to all of that, there is also a surprising amount of humor and ridiculousness thrown in to lighten the mood and make it a much more enjoyable film than your typical horror. Edith (Mia Wasikowska), Lady Sharpe (Jessica Chastain) and Sir Thomas Sharpe (Tom Hiddleston) all convey both sides of that coin extremely well — the frightened and frightening personas as well as the jokey and absured. Part of the reason I’m not that big a fan of the horror genre is that it rarely achieves what I view as its number one goal: scaring the audience. That isn’t to say I find most horror films creepy or disturbing; most are. However, the feeling I’m usually left with is that of uncomfortableness instead of a heart-pounding and fearfulness. Crimson Peak doesn’t really scare or frighten — though I do admit some scenes at the end had me cringe and made me a bit jumpy — but the brilliance is that it doesn’t need to. The shift in focus from suspense and shock to reasonable absurdity and the characters turned the film into something a whole lot more than just “meh.” By the end of the film I was fully engaged and eager to see where the twists and turns would lead and the result was quite entertaining.